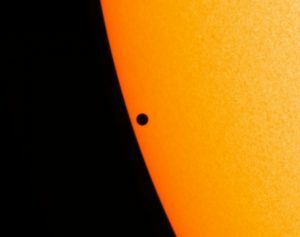 On May 9th, 2016, a special celestial event occurred when the planet Mercury lined up exactly with the Sun in the sky as viewed from the Earth. In Hampton, Mercury began to cross the disk of the Sun shortly after sunrise at 7:20am and spent a leisurely seven hours making a sharp, round shadow on the face of our home star. Such events are called transits, and Mercury does this between 13 and 14 times a century. 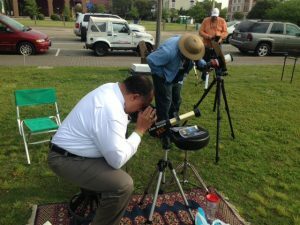 Dr. William Moore, Dr. Kunio Sayanagi, and graduate students John Blalock and Steven Buckner came out to set up telescopes and assist interested members of the public in viewing the event. 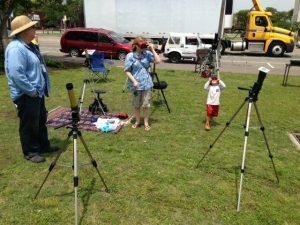 The Hampton University team helped out members of the Virginia Peninsula Astronomers/Stargazers who were also there with telescopes and special viewing glasses. Several dozen people came by during the course of the event, including Hampton University School of Science Dean Calvin Lowe.